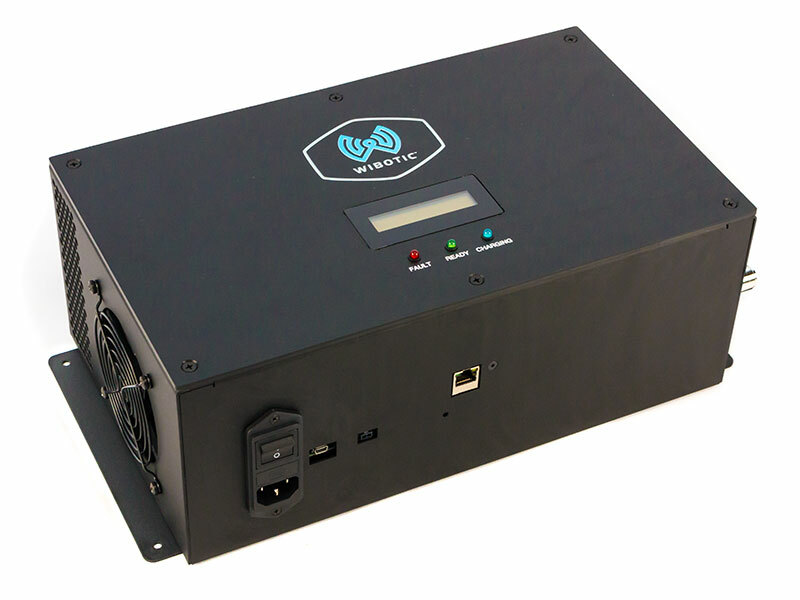 WiBotic transmitters (TRs) convert incoming AC power to a high frequency wireless power signal for transmission to Onboard Chargers. The TR-300 is WiBotic’s high-power Transmitter, with the ability to transmit up to 300W into a wide range of applications. Most often used for larger drones, mobile robots or marine vehicles, the TR-300 can be used in the WiBotic PowerPad (or other landing pads) or as a wall station for mobile robot charging. It’s metal enclosure includes flanges for easy wall mounting, an LCD display for system messages, and LED indicator lights to show system status at all times. The standard TC-200 transmitter antenna attaches via a short coaxial cable and a built-in Ethernet port allows external systems to monitor and control the transmitter using WiBotic’s Windows or Linux GUI or the Wibotic API. The TR-300 currently supports the OC-250 and OC-300 Onboard Chargers.